It's all about kites. Where we fly, when we fly, what we fly. Come share with us. You are currently browsing the tag archive for the ‘Banner Making’ tag. The weather has truly been against us as far as the community kite fly. And this day was no exception. Early morning rain, cloudy skies and high winds made it dark and gloomy and questionable for flying. 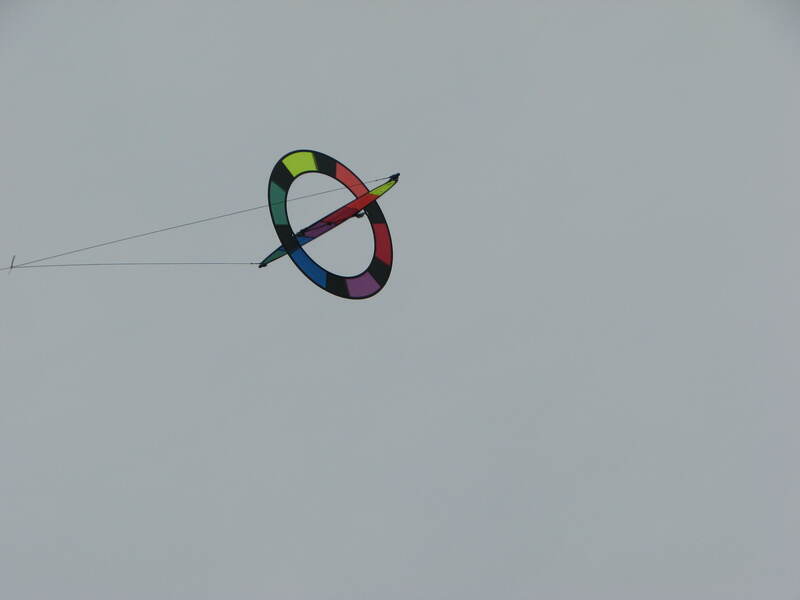 However, there were a couple of desperate people who were willing to take a chance and put a kite in the air. I got some heavier line and flew my Illusion delta with its tube tails. It handled the winds very well. 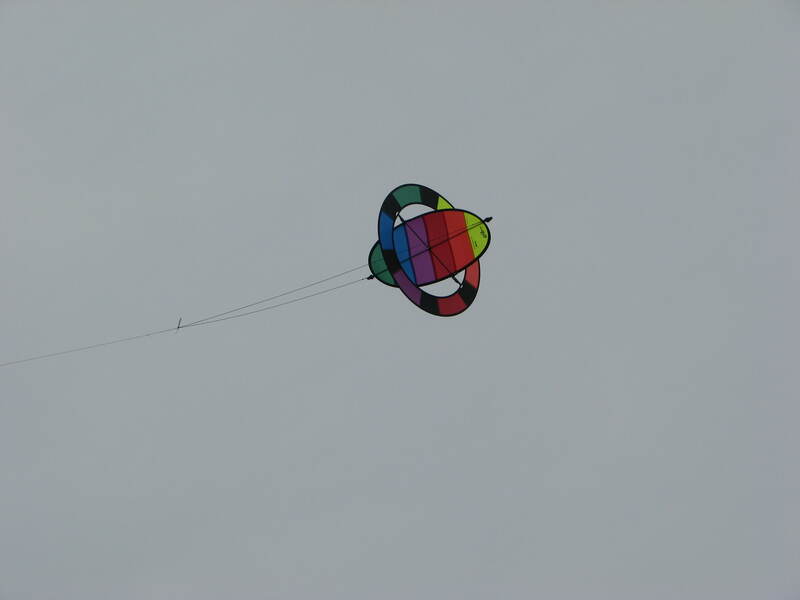 My flying buddy put up the little Spinner kite. It just hung in the gusty winds and spun itself into a blur. The line vibrated in a shallow repeating shallow sine curve. It really is a fun little kite. Because the temperature was mild, people were out walking the park. And that little kite drew a lot of attention. 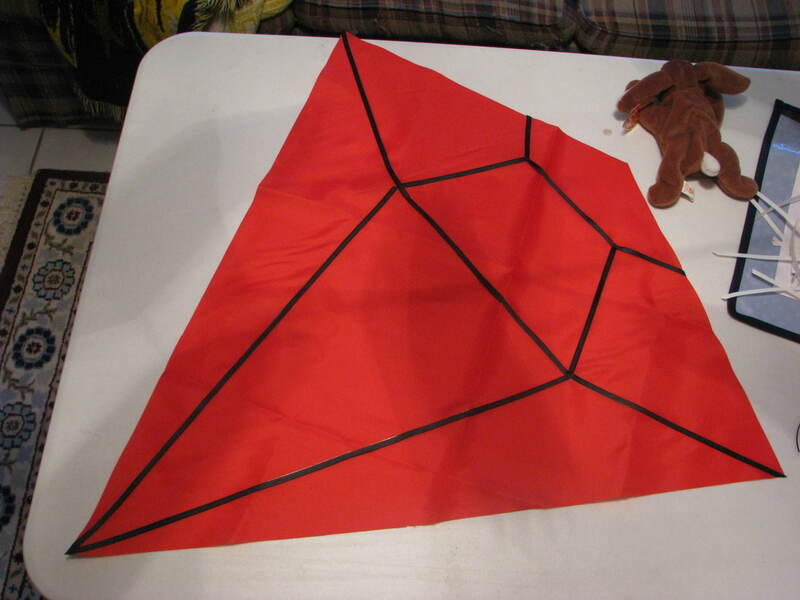 The kite build I began in the last post has been put on hold. 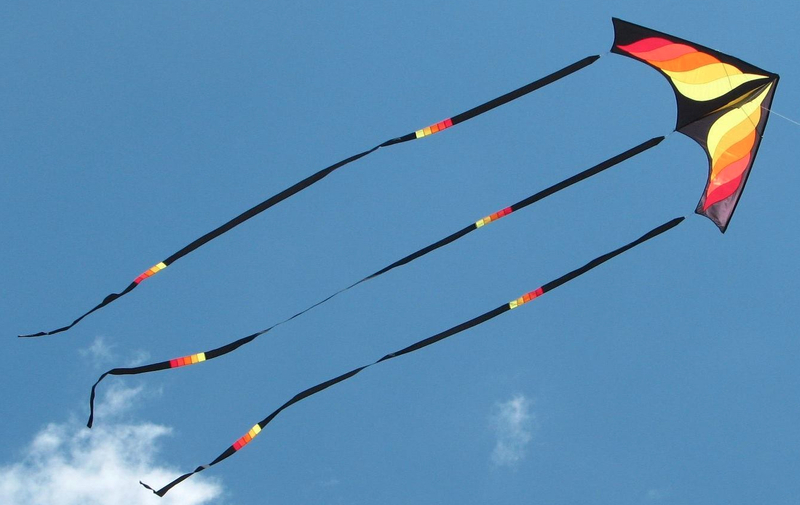 Instead, I am going to the Maryland Kite Society’s Kitemakers Retreat in Ellicott City, MD next month. I’ve never been to this four-day kite building marathon and am nervously looking forward to it. Several of my kite builder friends have been encouraging me to go, so this year instead of going to Kitemania in Florida, we’re going north. 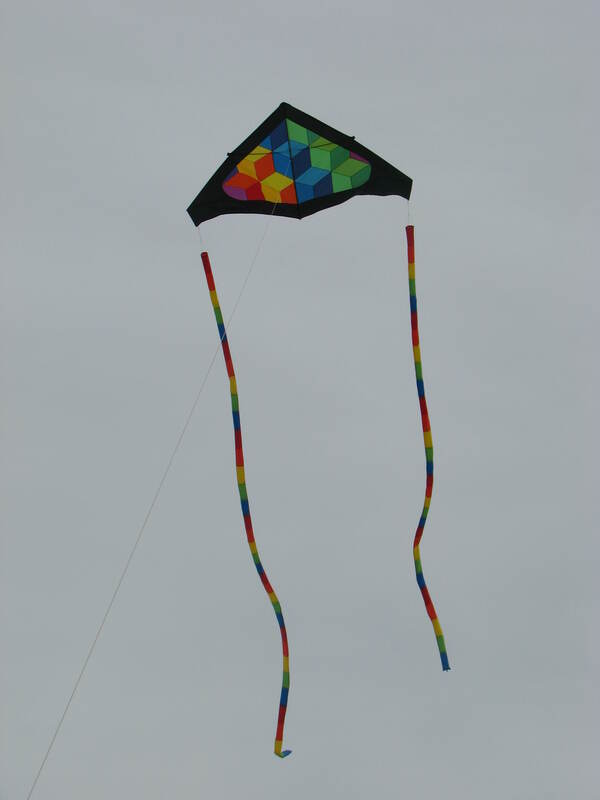 The featured presenter is Ron Gibian and I will be making a kite of his design. This is the 40th retreat so there are going to be some special activities. The gem for a 40th anniversary is the ruby. So one of the events is to build something with the anniversary/ruby theme. So I am starting a banner with ruby gems on it. This banner was meant to be, as a friend of mine was clearing out her stash of fabric and gave me some large pieces of nylon banner material. And, by coincidence, they were red and black. I’m hoping this turns out well as I’ve never made a banner before. So I’ve checked out some banner patterns and instructions and examined some commercial banners to see how they’re made. I think my idea will work. Keep your fingers crossed. 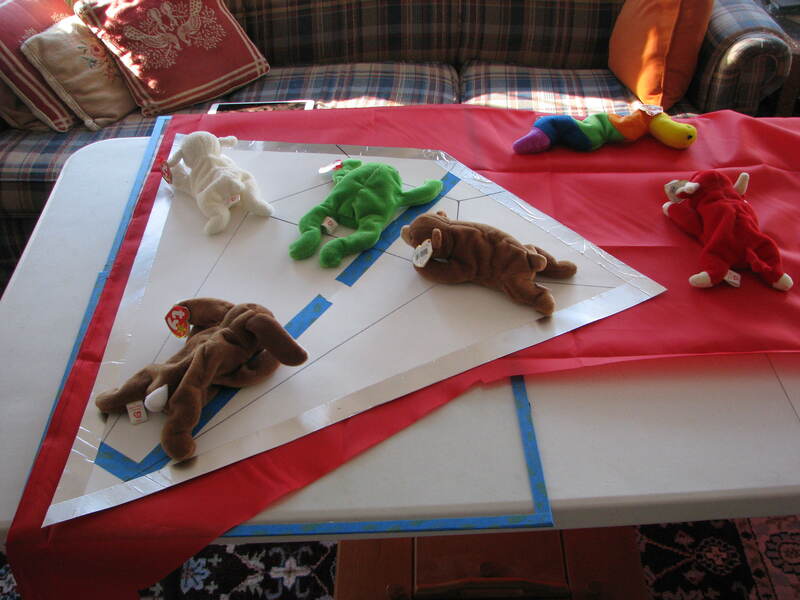 The Beanie Babies as weights idea was stolen from another kite builder friend. My bean bag weights were packed away and I have two drawers full of these little creatures courtesy of my grown daughter. Like most children, they leave half of their “stuff” behind when they move out to live their own lives. I hung on to these and will have them for the grandchildren when they come to visit. Maybe I can send them home a couple at a time until the drawers are empty. Or at least reduced down to only the ones I’m using as weights. What do you think? Kites Unlimited & Bird Stuff, etc.